Photo by flickr user fishines. Mac users are more likely to have college degrees and to prefer modern art, while PC users go more for the impressionists. 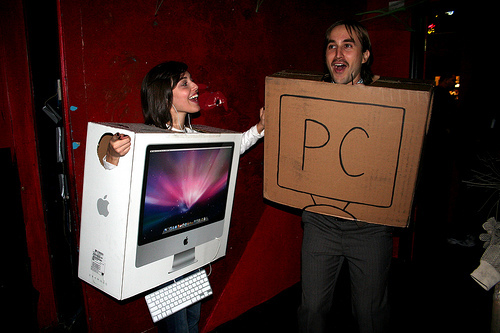 PC users are more likely to prefer sweet snacks while Mac users tend to go for the salt. Mac users throw more parties, eat more expensive french fries, and prefer to read the New York Times over USA Today, while PC users lean more toward Harleys than Vespas, tend to prefer suburbs and rural areas, and are much more likely to include meat in their diet. PC users are more likely to aim for tuna fish sandwiches and strawberry daiquiris while Mac users go for hummus and hot toddies. I’m not sure what any of this has to do with social sector capacity, but it’s good fun anyway.